Welcome back to the part of the Internet where random purple text and owning a domain called BloodOfKittens is not considered cool, where once again we will try to focus on the miniature painting hobby specifically how to give your minis that extra special base. Hobbyists with Internet access and a credit card are spoiled these days with specialty pre-made resin base manufactures. 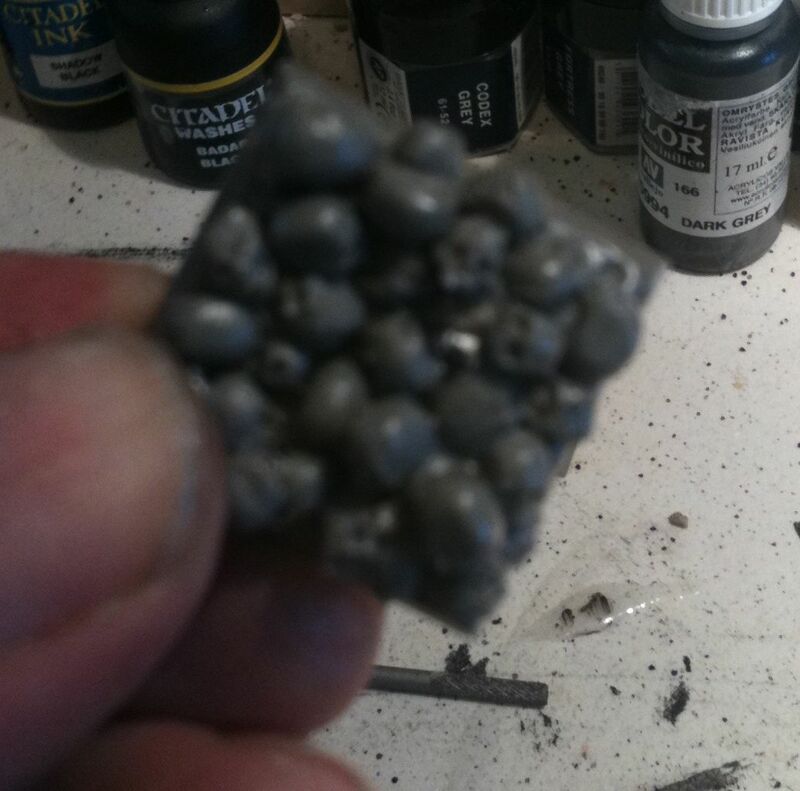 I’ve tried several and on my recent trip to Strategies Games and Hobbies on Main Street in Vancouver, I picked up some square bases covered in skulls manufactured by Micro Art Studio and Reaper Miniatures. I couldn’t find any cool cavalry bases (or 25mm by 50mm outside of GW land), so I was stuck with making one somehow. Now I’d read online of the miracle basing product known to the rest of the world as cork tile. Basically they are a form of flooring for homes, I found some excess thin cork at Urban Source, also on Main Street in Vancouver, which was 50 cents a piece. 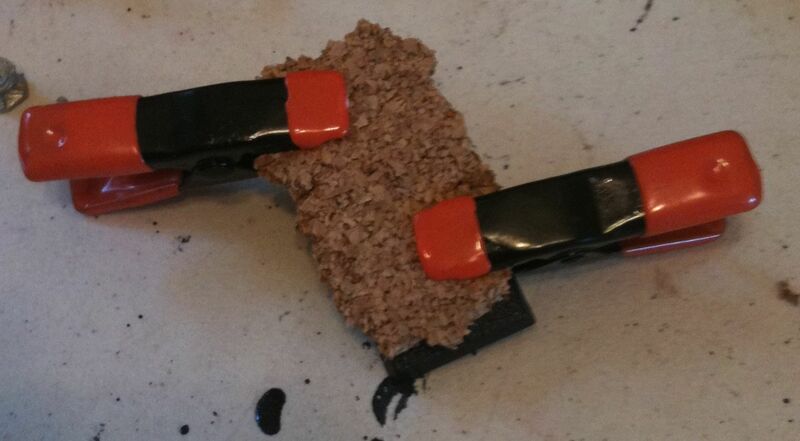 You can use this cork to make bases, or rubble, or even buildings for your miniature wargaming needs. First you need to cut out a piece of cork about the size of your base. It can be a bit bigger on the front and the sides, but for ranking up not too big. I don’t really plan to rank this model. After you cut the basic shape you just randomly bust off, or pinch off, little bits of cork around the edges until you end up with an irregular shape, that fits basically on top of your plastic GW cavalry base. Once you have a suitable shape, you get out your white glue, in my case Weldbond brand and you coat the cork with it on one side. You then position the cork on top of the plastic base and clamp it tight. Now you really need to give the glue time to dry, that is why I started with that part of my basing task. Next I started cleaning up the bits and pieces that make up an old Chaos Sorcerer, an old Steed of Slaneesh with Daemonette rider, and an old Fiend of Slaneesh. I used a file and in some cases an exacto knife. The Steed did not have a tab, but may have had one originally, I got the model in a trade of sorts in about 1996, maybe be a bit after. 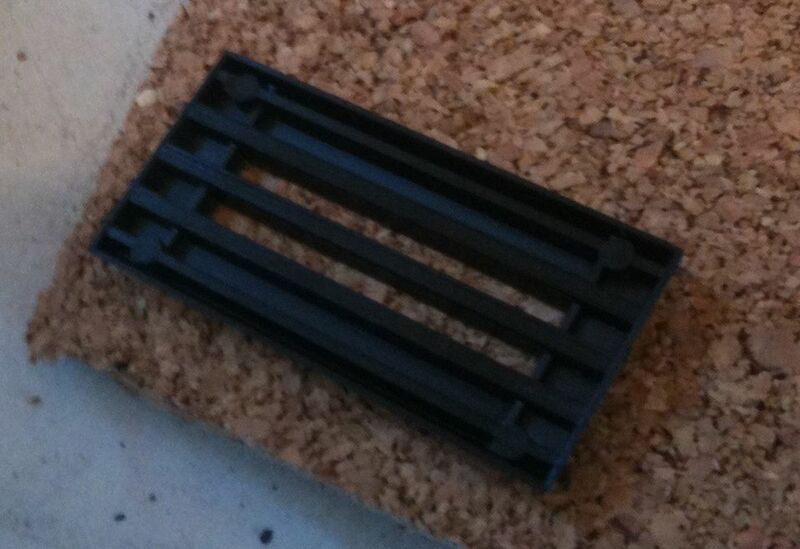 I filed down the feet so I’d have a nice flat surface to work with. I test fit the legs and put weight on the back to see which position would be most solid. Then I put super glue in the molded holes and glued both legs at once and let it sit. It stands upright as you can see in some of the photos, this should make mounting it to the base easier. After that I glued the rider together. I twisted the upper torso around quite a bit, not to be dramatic, but because that was how the model fit together tightest. You can do a certain amount of filing and adjusting, but sometimes you just have to go with whatever pose works best. Finally I glued the lower jaw to the head and let the Steed sit on my hobby table in three separate pieces, four if you count the base. The sorcerer was going to be the easiest, but still might provide a lesson in mounting models to resin bases. 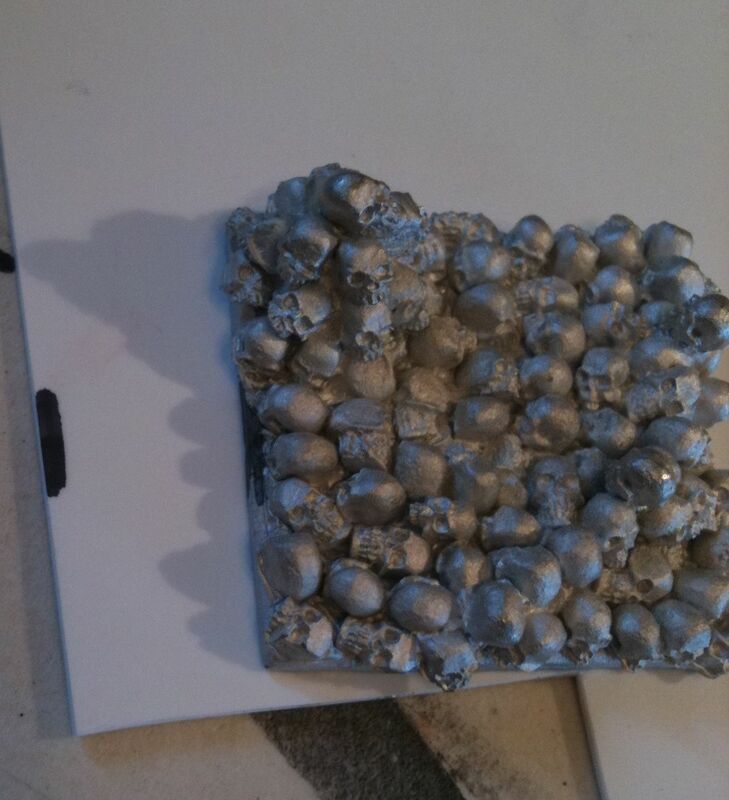 That is right I’m using pre-cast skull bases that I bought in a blister. I clipped off almost the entire tab on the sorcerer. 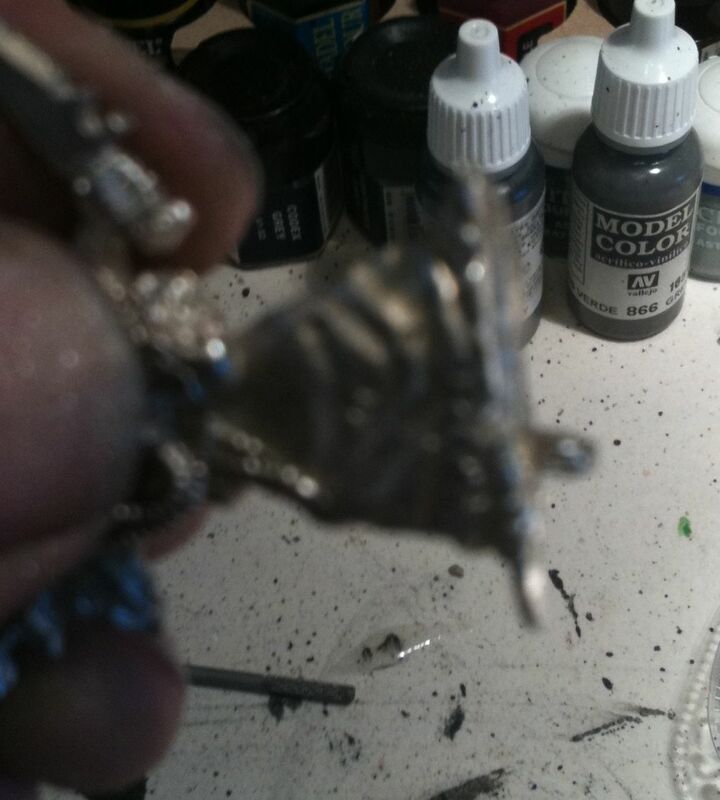 When mounting metal models to resin bases it is best to leave a small spike of metal jutting out from the bottom of the model. I didn’t take the best photo at this stage but I was busying working away and all these pictures were just quick snaps with my iPhone. After filing the the tab as level as possible I then test fit it on all five skull bases in the blister. 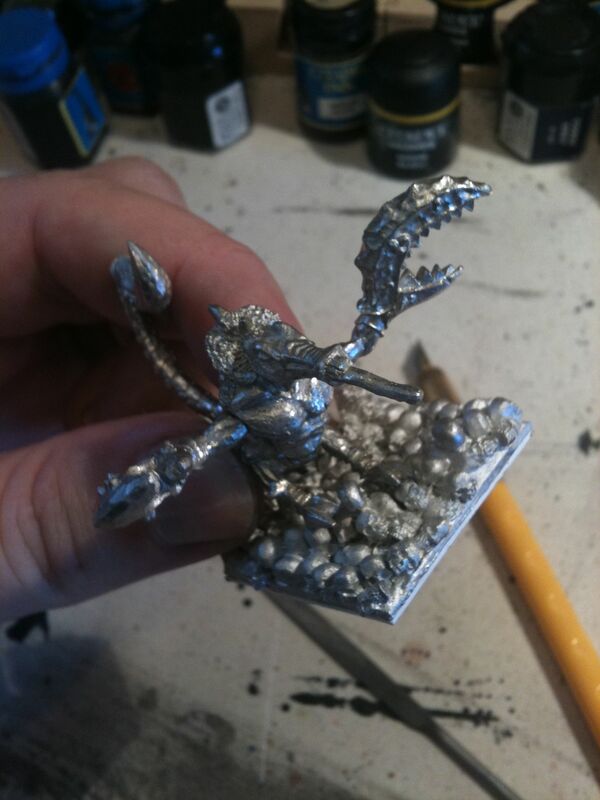 I found the one that seemed to work best with this model and I painted a dab of white paint on the metal spike. Then I again test fit it, now there is a little glob of white paint on the base where the spike should go. You then drill this out with your pin vise. Then you test fit the model again and assuming all is well glue the bottom of the model and the spike to the base. Setting aside the sorcerer I turned to perhaps the most problematic of the three models, the circa 1995 Marauder Fiend of Slaneesh. I gave this model a good filing and test fit the various pieces. The main torso is in two pieces and the base I bought for it is solid metal. 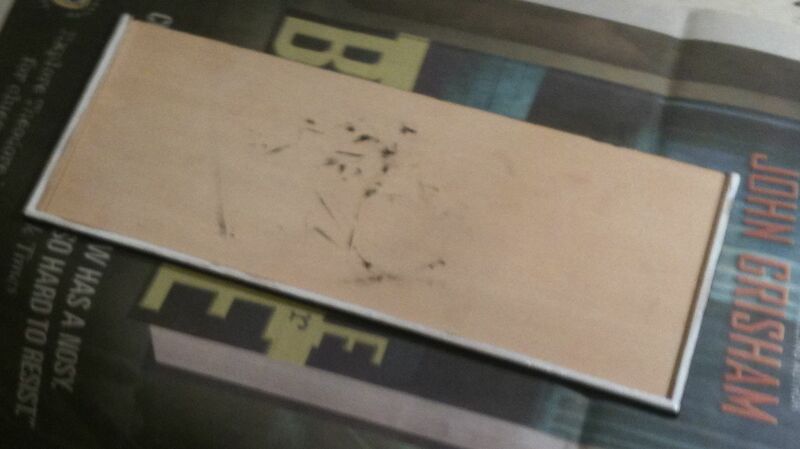 The first thing I did actually was trace out a 40mm by 40mm square of sheet styrene. I scored it and broke it off like it says to do on the packaging. Then I glued that to the bottom of the Reaper skull base which I’d also cleaned with a file and exacto knife. If you use super glue like I did you only get one chance to do this. If it is a little off you can just file and cut off the white styrene that sticks out. Even before I opened the blister I’d decided to do this, I thought the model would slide better on the table and it added a little bit more height to the small Fiend of Slaneesh. Turns out the base is partially hollow, I don’t think the sheet styrene was absolutely necessary, but I had it at hand and it does slide nice on my hobby table. After basing the base I decided to trim off the tabs from the two halves of the Fiend torso. I had already decided it was best to get the torso together before trying to base it. I left a single spike on one leg and filed the rest flat. It actually fit quite well on the base with three legs supporting it upright. 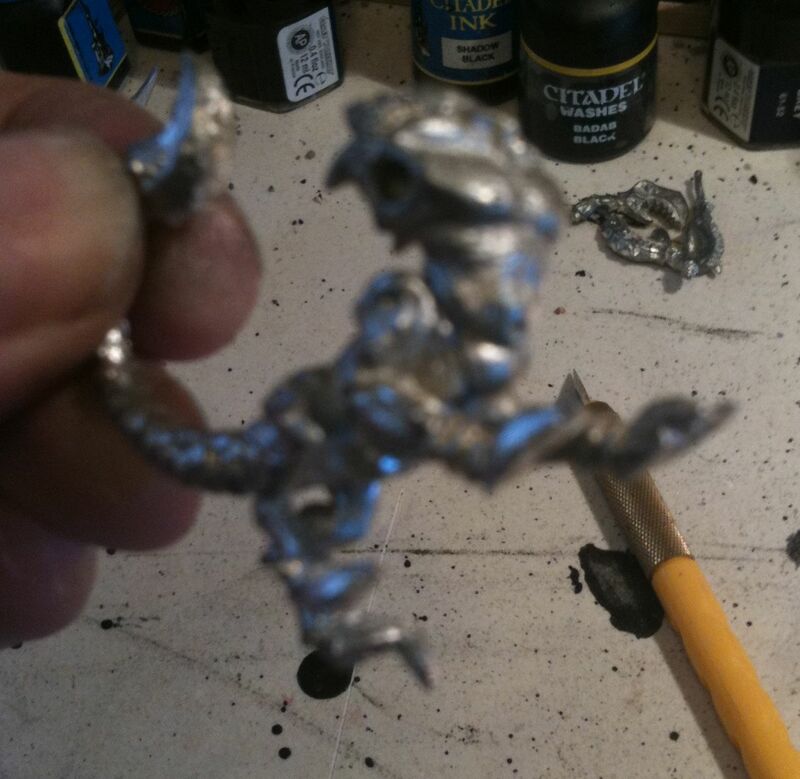 I’ve gotten ahead of myself, old multi-part metal models are often notoriously difficult to get a good fit. This model wasn’t bad, I didn’t get out greenstuff, but I did file it a lot before and after I super glued it together. With the model together and an optimal position on the base determined, it was time again for a dab of white glue and the pin vise. I didn’t drill into the styrene, the base is plenty think enough to accommodate the spike. Again I put super glue on all four paws and the spike and set it down on the base. I held it together for 30 seconds or whatever then got out the arms. I test fitted them and though the pose might not be the best, again I went with the tightest fit. One arm fit better than the other so I did yet more filing. At some point the model came partially unglued from the base, so more super glue to the rescue. With the arms on the model, it was time for the head. This had lots of surface to glue to, but not the best fit. I may get out the green stuff for this, but I might just go with it. It’ll likely never be an award winning model but I still think I can make it look cool. I dubbed it “Retro Demon” and it will get a suitably disco paint job. I flipped over the cork base and could still see white glue. White glue, the brands I prefer anyway dries clear, that is how you know it has set. So it was time for lunch and a blog post, not exactly in that order, but I’m getting hungrier as I type. Later tonight I may finish off the cork base and the Steed of Slaneesh which is the most instructive half of this little project, then it is primer and back to brush work for me. Though before that I may build a couple of movement trays and there is also 54 Night Goblins that need to have their bases finished. They’ll get less elaborate bases to be sure. I have a lot of work to do in order to play in the Warhammer 8th Edition Mighty Empires campaign. 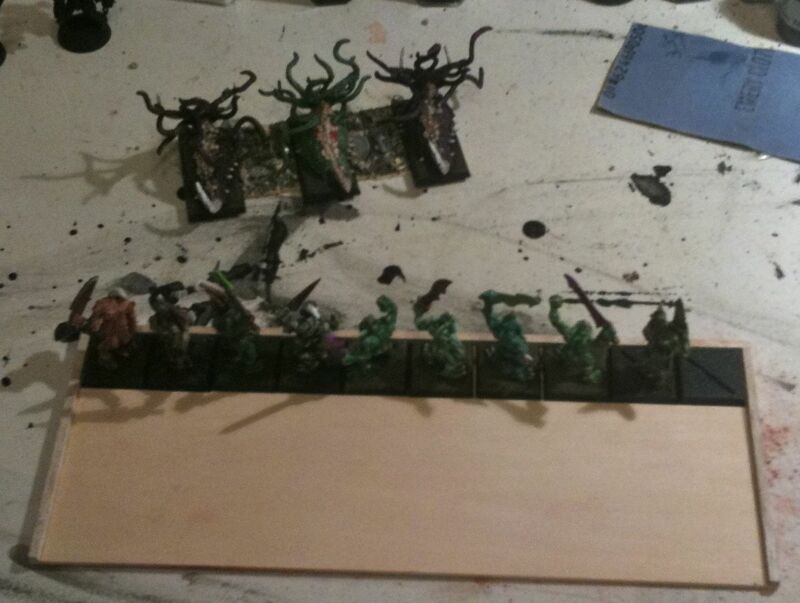 So work has been ongoing on re-basing my old Beasts of Nurgle and creating a custom movement tray for my Horde of 40 Plaguebearer. These models and a couple Nurgling stands and Slim are set to make their Warhammer 8th Edition debut. Most of these models have never been used in WFB. I think Slim hasn’t, the Beasts have and maybe 16 Plaguebearers have. I didn’t have much luck gaming with them over a decade ago. Daemons could break and run, they had no ranged attacks and negligible ranged spells. Beasts moved random distances and not terribly fast, my most reliable unit in the few small games I played was the Nurglings. Now under the current rules they may be the weak link, of course in bigger points games I can field 10 stands which might make a difference, my proposed 2000 point list had two units of 5 stands, while at 1500 points I have one unit of four stands. Anyway it isn’t a tactical army or carefully chosen, it is just a bunch of Nurgle demons I painted up for the Diseased Sons. 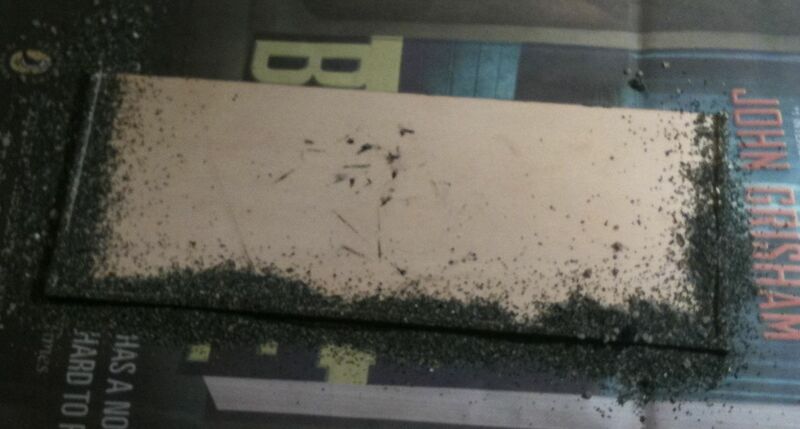 The bases and movement tray were made of balsa wood, glue, and sand. I used some plastic and metal bits to decorate the Beast bases, but mainly it is my traditional drybrush order of Scorched Earth, Snakebite Leather, and Bubonic Brown. After the drybrushing was done I touched up various bits on the Beasts with black. Then I just plan to do a quick job on the little details I added so I could get everything finished and either take a break from painting tomorrow or get back to working on my Astronomi-con Vancouver army. They do not rank up the best. 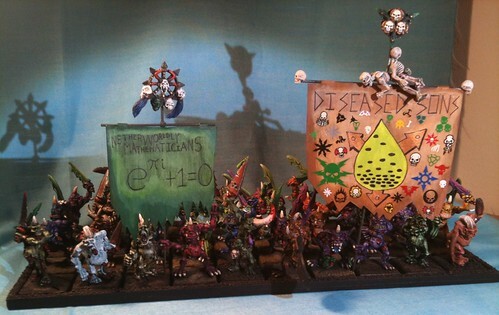 Most of them are fine but the DIY standard bearers and even worse the DIY Gong of Despair just won’t rank up. I think I need to retire that model and paint the musician with the bell that I picked up more recently. 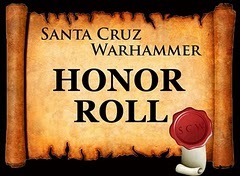 Originally when the rules came out you had to convert your standard bearers, musicians, and unit champions. You still kinda have to convert your Heralds of Nurgle. I’m just using the one with the bigger banner. This was actually quite a lot of work. I was all proud of my old world handcrafted quality but when I was using a size three brush to paint the tray black, I started thinking that it is worth it to buy pre-made movement trays especially if you can get them magnetized which is my plans for the goblins, I just need to talk to Litko and of course get a job and make the money to afford it. If I add anymore units to my tenuous Warhammer Daemon army, say a unit of Daemonettes or even just some Flesh Hounds of Khorne I may go all out and get premade bases and matching movement trays, Micro Art Studios and others make really nice resin pieces. 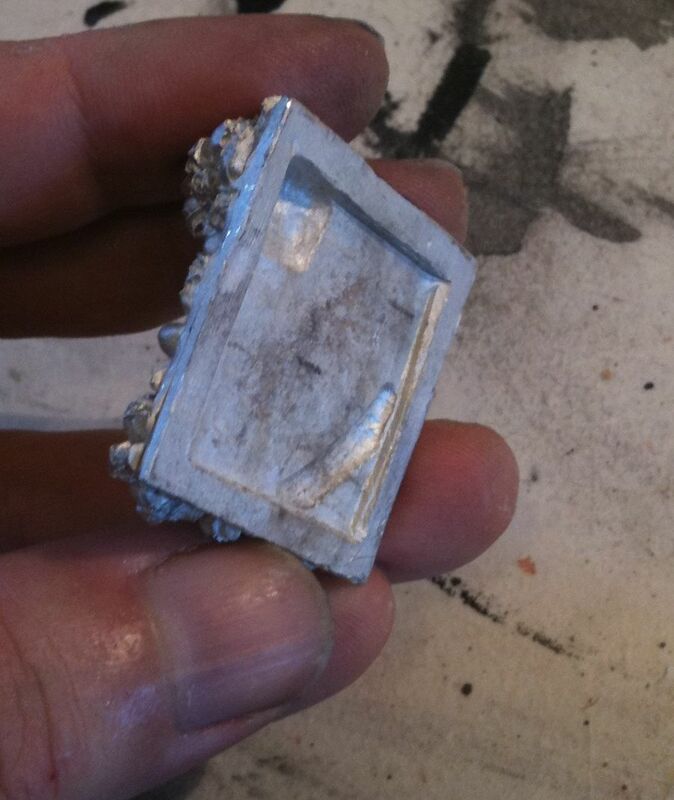 If you’re going to put as much time and effort into your models as I usually do, the extra expense for the resin bases isn’t that much and it does tie the unit together which is doubly important in Warhammer Fantasy Battle.